We’re all familiar with the 504 gateway timeout error, even if you don’t know it by that exact name. Simply put, it pops up when your browser can’t establish a connection to a website. As a user, it can be incredibly annoying. However, as a site owner, the 504 error can be negatively impactful on your traffic numbers. This not only translates to lost traffic, but conversions and income too. Fortunately, the 504 gateway timeout error is so common that troubleshooting it is a relative cakewalk. In this article, we’re going to talk a bit about what causes the error and the forms it can take. Then, we’ll teach you four ways to fix it. The 504 error pops up more often than you think, and it’s no reason to panic. You’ve probably run into this error at one time or another while browsing the internet. A lot of people confuse it with error 404, which pops up when a page doesn’t exist, or it isn’t available. In contrast, error 504 appears when your browser knows there’s a page there, but it can’t establish a timely connection to it. To understand this further, we need to talk about how websites work at a basic level. For a website to be accessible, it needs to be hosted on a server with external access. When a site’s domain is accessed, the browser will establish a connection to the server and wait for a response. If the server fails to respond, the website won’t load, and your visitors will see the 504 error. So far, the process sounds simple. However, a modern internet connection will route through several servers (or gateways) before it reaches its destination and servers a website. If any of those servers fail to respond, you’ll also run into error 504. A problem with your proxy settings. In some cases, the proxy server you’re using can be the link that fails to respond in time. Your domain is inaccessible. As you may know, your domain needs to propagate before everyone can access it. Attempting to access a domain too soon after registering it can sometimes lead to a 504 gateway timeout error. An issue with your Content Delivery Network (CDN). Sometimes, using a CDN for your website can cause 504 errors, although these types of issues are rare. Problems with your hosting provider. In our experience, the most common causes of 504 errors tend to be issues with your web hosts, which usually get solved without any input from you. As we said, 504 gateway timeout errors will often get solved without your input, although this doesn’t mean you shouldn’t pay attention to them. If your web host is the source of the problem, the error won’t persist for long. After all, good hosting providers are usually on the ball about taking care of this kinds of issues. However, if the 504 error persists for a while – let’s say, over an hour – it’s a cause for concern. In these cases, you’ll need to be proactive about finding a solution, which is where the next section comes in. If the 504 gateway timeout error persists for too long, it doesn’t hurt to contact your hosting provider’s web support and system status. However, if all is well, you’ll need to assume the problem is on your end. Also, keep in mind the 504 error isn’t exclusive to WordPress sites. With this in mind, one of the solutions below will target WordPress websites in particular, but the rest are methods you can apply regardless of which platform you use. In a lot of cases, plugins can slow down your site’s response time and cause a 504 error. The problem is, most WordPress websites use several plugins at once, so narrowing down the culprit can take time. Since you won’t have access to your dashboard, disabling your plugins will require a bit more work than usual. To follow our instructions, you’ll need a File Transfer Protocol (FTP) client, such as FileZilla, and to potentially brush up on your skills. This approach enables us to keep track of the plugins we’ve turned off, which is important. Your mission now is to disable each plugin in turn, and check your website. If one of these plugins is the culprit, your site should become accessible after you disable it. If that’s the case, you can go ahead and re-enable the plugins you turned off. To do this, use the Rename option again and return their folder names to their original values. Just remember not to activate the offending plugin again for now. Depending on which plugin it was, you may need to find a way to get it working again. In some cases, updating the plugin should solve the issue, or you may need to contact the developer for a fix. If the plugin is essential to your workflow, you may need to look for an alternative. It can be a hassle, but it’s much better than having an inaccessible website. If your connection is configured to use a proxy server, this may also be the cause of the 504 error. To test this theory, you’ll need to access your browser settings and check if you have a proxy server enabled for your local network. Now try accessing your website again to see if that took care of the problem. If your proxy server was the cause of the 504 error, you’ll probably be able to use it again in a little while. However, we recommend not enabling it back again until at least a few hours. We’ve talked about how the Domain Name System (DNS) works in the past. To sum up, when you register a domain, the information needs to spread (or propagate) through a network of servers that make up the DNS. Sometimes, this process can take up to 48 hours, which means some people might be able to access your site. However, others won’t, so will run into a 504 error. However, if a majority of nameservers return a negative result, your domain isn’t done propagating yet, which can be the cause of your 504 woes. Figuring out if your CDN is the problem, in this case, is simple. 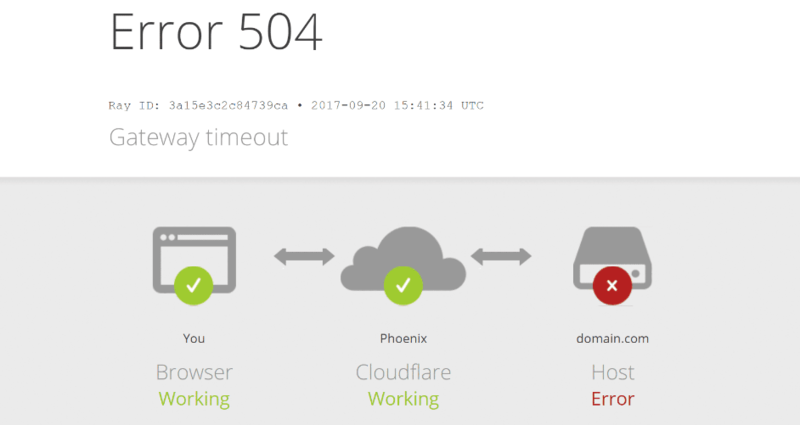 Most of the top CDN providers will return errors such as the one above, indicating exactly why they can’t serve your website right now. If you run into a 504 error, the quickest way to solve it is to temporarily disable your CDN. Naturally, you won’t want to keep your CDN turned off indefinitely. In most cases, the problem will take care of itself quickly, but we recommend keeping your CDN disabled for at least a few hours, just to play it safe. When you’re ready to turn it back on again, just return to the Overview > Advanced section and flip the switch back. The 504 gateway timeout error might seem harmless, but you should definitely spring into action to fix it if it pops up. In some cases, it can go away on its own. However, if the error persists for an hour or more, you probably have a serious issue in your hands. Disabling your WordPress plugins until you find a culprit. Testing your local proxy settings. Checking your domain’s propagation status. Temporarily disabling your website’s CDN. Do you have any questions about what to do if you run into the 504 error? Ask away in the comments section below! Article image thumbnail by windwheel / shutterstock.com. Thanks John, I’ve come across this error many times in the past. Some were related to websites on shared hosting with WooCommerce and WP Courseware. Shifting these sites to better performance hosting (in particular with more RAM and adjusting wp-config to use that) fixed the 504’s. Another time, all my websites suddenly developed 504 – very concerning. Through a step-by-step trouble-shooting process, I eventually discovered it was my router. When I rebooted the router, everything worked fine. So it may be worth checking that something related to caching isn’t causing the problem if the other solutions don’t work. You just saved me opening a ticket with them, this solved my issue on SG. Thanks! Thanks for introducing a aaluable tool for checking DNS! Definitely worth adding to the hosting checklist! Create a “temp” folder inside your plugin folder and move all your plugin inside. Then remove one by one the plug-in back to the plugin directory. Is much faster than rename all folder one by one. Thanks to inform deeply about this wordpress tool. After read this i know how i can solve my gateway error. I have been facing this problem and didnt find any good solution, thanks for the article, I am also facing 404 errors sometimes.